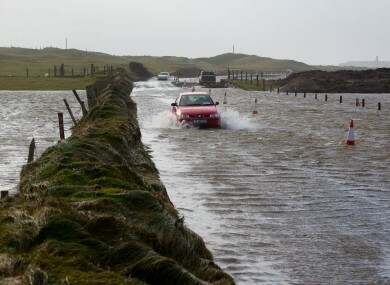 Road flooding in Lahinch Co. Clare. FUNDING FOR REPAIRS to transport and coastal facilities following recent storms will be considered by Government departments in light of priorities outlined by local authorities. The response to the storms will be considered by local authorities before a preliminary report is then brought to Government next week. The process was outlined today by the National Coordination Group (NCG) which today met in response to the recent severe weather and assessed the impact of the storms on infrastructure and communities. The group said that the Department of Social Protection (DSP) has so far assisted a small number of households that were affected by the storms and flooding. The DSP advised that any person experiencing hardship as a result of storm damage is advised to contact their local DSP office which administers urgent needs payments under various exceptional needs schemes. The meeting of the NCG was attended by the Minister of State with responsibility for the OPW, Brian Hayes as well as representatives from Government departments, response agencies and local authorities. The group noted that the new Met Éireann colour-coded weather warnings were of assistance to the public as well as varous agencies “in understanding the threats posed by the weather situations”. “Safety messages had been responded to well by the public but, regrettably, one fatality was attributed to a severe storm,” said the NCG. Email “Local authorities will outline priorities for storm repair funding”. Feedback on “Local authorities will outline priorities for storm repair funding”.